As the country prepares to welcome Pope Francis, the third pope to visit the Philippines, ABS-CBN will lead in spreading his message of mercy, compassion, and love to Filipinos whenever and wherever they are through its multi-platform coverage of the historic papal visit. Through up-to-date reports and special features, ABS-CBN will deliver all the latest developments of the highly anticipated papal visit from January 15 to 19 on its news platforms on free and cable TV, radio, and online: ABS-CBN Channel 2, ABS-CBN News Channel (ANC), DZMM TeleRadyo, DZMM Radyo Patrol Sais Trenta, and their websites and social media accounts. ABS-CBN, ANC, and DZMM will broadcast live all the Masses to be celebrated by Pope Francis at the Manila Cathedral (January 16), in Tacloban (January 17), and in Luneta (January 18). Aside from that, ABS-CBN will offer free public viewing of the Luneta Mass at Alabang Town Center, Glorietta, Trinoma, Fairview Terraces, Market Market, and Harbor Point in Metro Manila and in more than 50 locations nationwide. No stone will be left unturned when ANC brings its wall-to-wall coverage of the historic visit with nonstop live updates from all the events beginning the morning of January 15, while DZMM will cover the papal visit starting at noon on January 15. Boosting ABS-CBN's news coverage are the Pope Patrollers of citizen journalism arm “Bayan Mo, iPatrol Mo" who will be closely monitoring all the on-ground papal events in Manila and Tacloban. The Pope Patrollers will document the events as they unfold in photos and videos, which will capture the mood and emotions of the people during the five-day papal visit. All of the Pope Patrollers’ works will be highlighted in special sections on ABS-CBNNews.com/PopeFrancisPH, which also houses all TV reports and interactive multimedia features about Pope Francis. Filipinos on the go may also check all the latest papal visit-related developments on their mobile devices by watching ABS-CBN’s consolidated videos and features in the PopeTYSM (Pope Thank You Sa Malasakit) channel on iWanTV.com.ph or the iWanTV app using an ABS-CBNmobile SIM. Filipinos abroad can also keep track of the latest developments of the papal visit via The Filipino Channel (TFC), which will air its special live coverage of the event from January 17 to 19 and a documentary titled “Pope Francis: In the Eyes of Four Filipinos,” which features four different members of the clergy who share a very special, albeit experience -- a rare interaction with the Holy See. With Vatican Media correspondent Lynda Jumilla who is joining the papal flight, ABS-CBN’s “Thank You sa Malasakit: Pope Francis sa Pilipinas” coverage will be led by veteran broadcast journalists Noli De Castro, Korina Sanchez, Ted Failon, Tina Monzon-Palma, Karen Davila, Ces Drilon, Julius Babao, Alvin Elchico, Bernadette Sembrano, Henry Omaga Diaz, Vic Lima, Bro. Jun Banaag, Winnie Cordero, Ariel Ureta, Pinky Webb, TJ Manotoc, Ron Cruz, Coco Alcuaz, Gigi Grande, Karmina Constantino, and David Celdran. 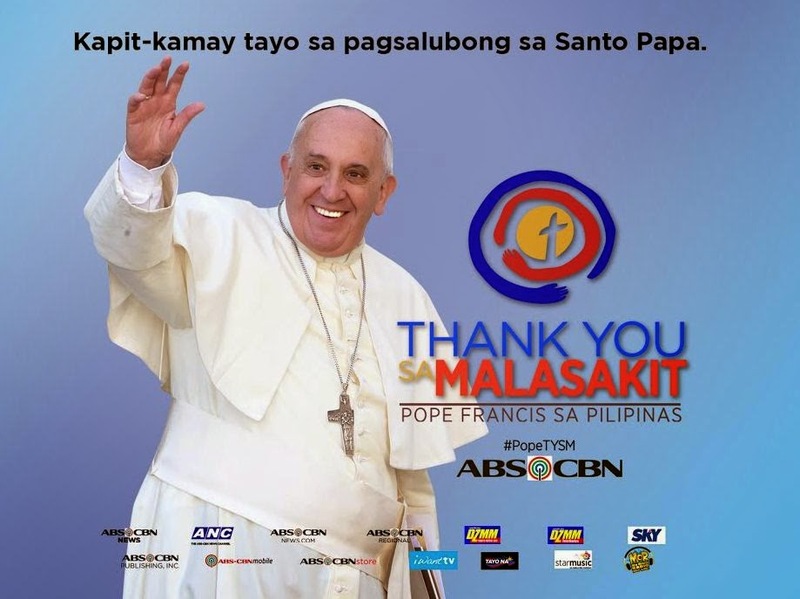 Aside from tuning in to ABS-CBN’s papal visit news coverage, join its PopeTYSM campaign to thank Pope Francis for his message of mercy and compassion by sharing personal messages and prayers on social media or visiting kapamilyathankyou.com. All of these posts are housed on ABS-CBNNews.com/popefrancisphwall and have a chance to be included in ABS-CBN’s Book of Thanks that will be given to Pope Francis upon his departure. Tune in to ABS-CBN’s comprehensive “Pope Francis sa Pilipinas” news coverage on ABS-CBN Channel 2 on free TV, ANC (SkyCable Channel 27) and DZMM TeleRadyo (SkyCable Channel 26) on cable TV, DZMM Radyo Patrol Sais Trenta on radio, and ABS-CBNNews.com, anc.yahoo.com, and dzmm.com.ph online. Follow @ABSCBNNews, @ANCALERTS, @DZMMTeleRadyo, and @bayanmo on Twitter for fresh updates. Also watch SKyCable’s uninterrupted coverage of the papal visit on Channel 99 (SD) and Channel 195 (HD).